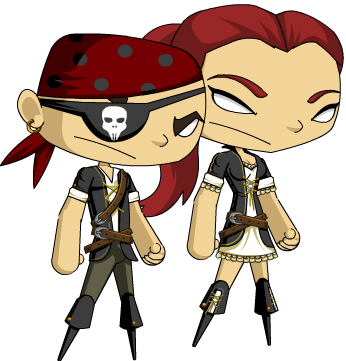 Let’s start the week off right with new Player Suggested items and a sneak-peek of my favorite upcoming event: Talk Like a Pirate Day. Over the weekend, Yergen snuck online and released 3 new player suggested items! 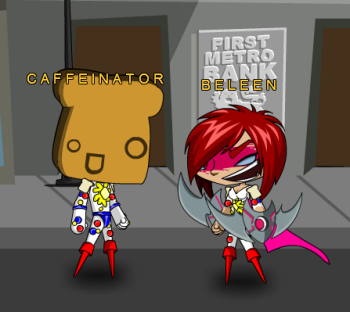 Me and Caffeinator loafing around. Bad guys are TOAST! 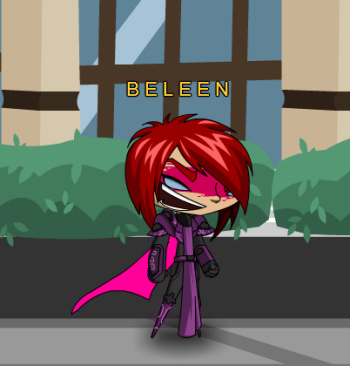 Now, I know what you’re thinking—that derpy bread helm could ONLY be the work of Beleen. But it wasn’t! Seriously! Your fellow player Wonderp Bread inspired the transforming Wonderped Bread Helm that pairs up perfectly with the Wonderped Bread Armor. The Attack Gloves that I’m sporting is the fine work of Gead, and all of these items are obtainable in the Hero Spire and Skull Deep Kiosks. WOAH! Is that a Chaos Lord?! Naw—it’s just the Supreme Commander Armor! Most people have a misconception of Chaos. Some think that Chaos is aligned with Evil, but if AQWorlds has taught us anything, it’s that Chaos is neither Good nor Evil. Chaos is, in fact, a commanding force that can be harnessed by Heroes and Villains alike. And today, you too can equip this wicked armor at the DTU Kiosks for 30 DTs. One of my most favorite holidays is making landfall next Monday, September 19th. Some land lubbers think it’s kind of silly, but for all my fellow swashbucklers out there, this holiday is a treasure chest just waiting to be plundered. It’s Talk Like A Pirate Day, matey! Here’s a sneak-peak of some booty you can salvage during HeroSmash’s first ever Talk Like A Pirate Day. You gotta give mad props to Zheenx for making this armor set—and he actually based the design off my real-life pirate costume that I own! That artist be a genius, that he be! But as far as TLAPD spoilers go, that’s all I know. For now. But as soon as I find out more, I will be sure to post them here on the Design Notes or on my Twitter! Market Street Theater is Live - It's Pirate Time! Visit Market Street by clicking on the map, or go thru you HALdroid. Once there you can visit the Movie Mega Plex. Get your movie themed items there. The Mega Plex is currently featuring a Pirate themed shop! The themed shop will only be open for one week only. After that all the items will disappear for good. That's right... All items in the Movie Shop are PERMA-RARE! Jemini and Thyton really made some amazing armors for this release. 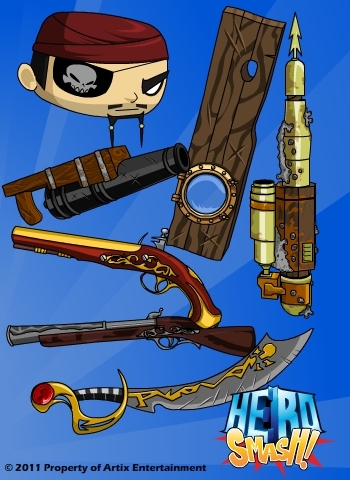 Randor the Red rocked out a huge stockpile of pirate themed weapons. Even Polistar got in on this release. Yours truly even made a set of animated head morphs! Yea yea – Pirates, blah blah – What else is new? We made some graphical changes to the engine to help game play, and stories a bit easier to understand. Aquatian Ruin got an update and a corrected cut scene. Visit Malandra in Overlook and you can see her see the new cut scene for yourself. Spear has moved to his new location – Professor Smash’s Power Academy in Liberty Square. That’s the place you want to go for all your super power needs.